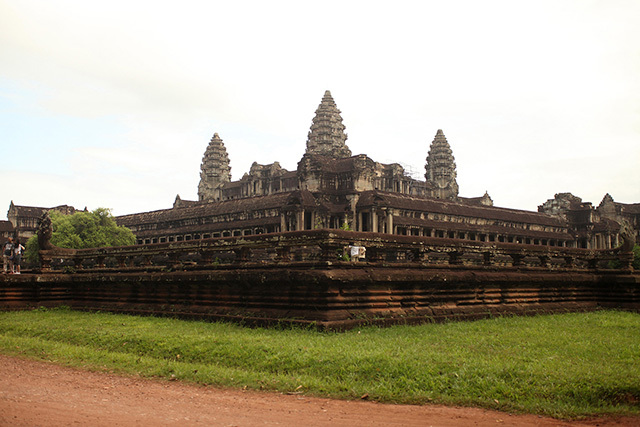 Siem Reap is most famous for the Angkor Wat temple complex. Although this sight is spectacular to see, there is more than meets the eye. 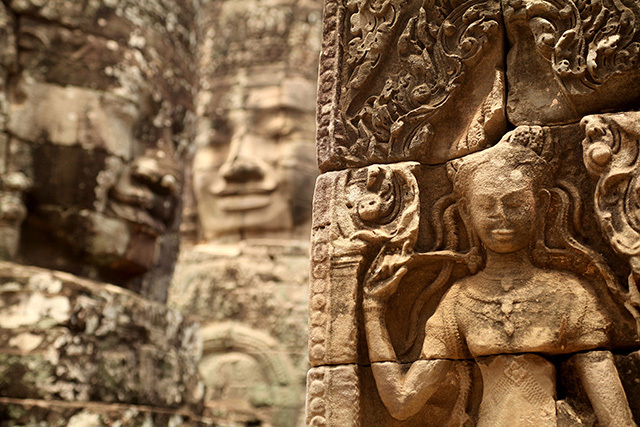 For hundreds of years, this area was the heart of the Khmer Kingdom which not only heightens its status as a cultural and spiritual symbol, but also an archeological and historical splendor as well. 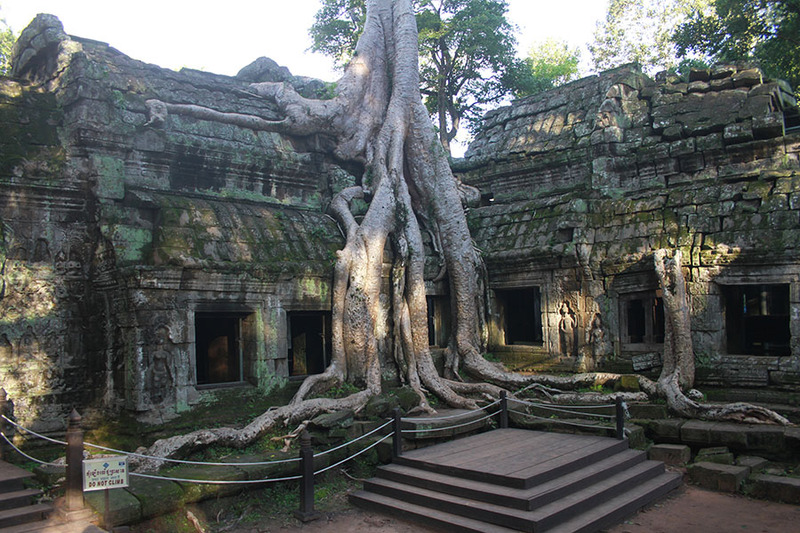 As a result, Siem Reap is an especially intriguing destination. 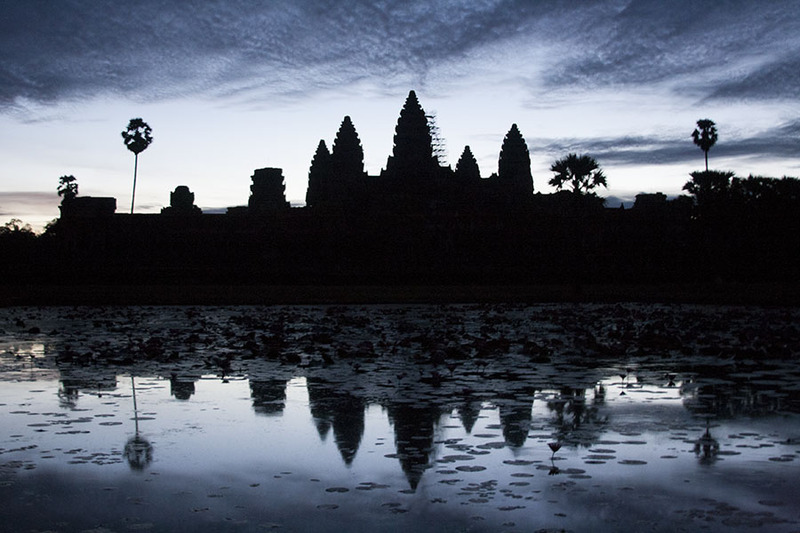 Our Angkor Sunrise Tour combines this magical moment with all of the highlights usually associated with our acclaimed Angkor tour! 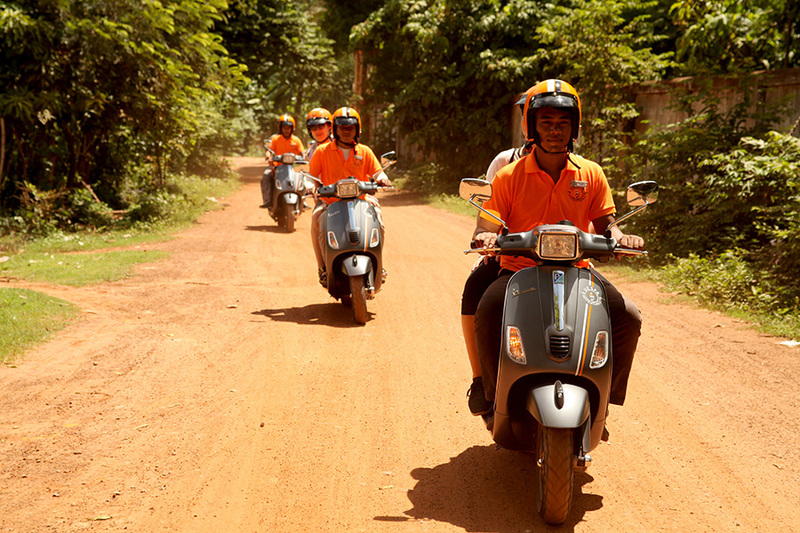 But in true Vespa Adventure fashion we do things differently to ensure a unique and unforgettable experience that will stay with you forever! 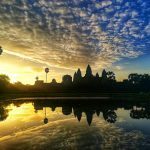 Our Angkor Sunrise combines this magical moment with all of the highlights usually associated with our acclaimed Angkor tour! 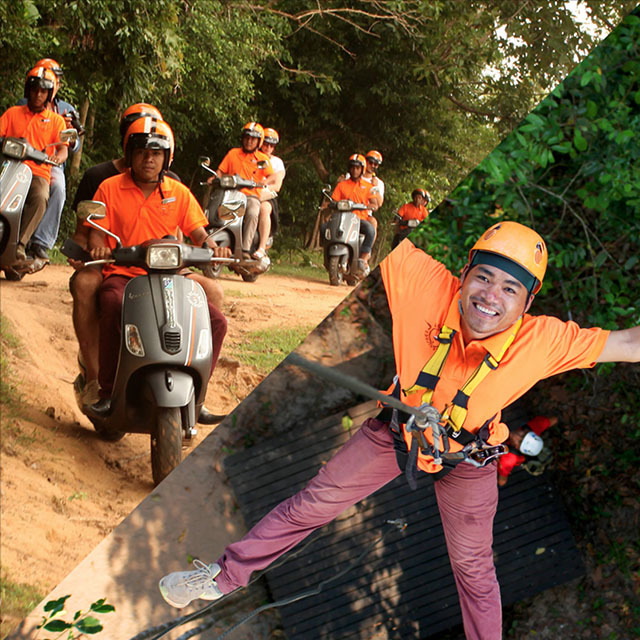 But in true Vespa Adventure fashion we do things differently to ensure a unique and unforgettable experience that will stay with you forever! Upon entering the archeological park, we separate ourselves from the other tourists and take you to a hidden and seldom used entrance. There is silence as we cross the lotus filled moat under the moon and the stars. The silence is broken by the early morning chorus of the birds and insects as the sun begins to rise. Still we find ourselves alone until we reach the other side where all the other sunrise visitors are lying in wait with their cameras ready.Your guide will lead you to the best photo spots before retreating once again from the crowds to enjoy what needs to be a peaceful moment of reflection at this World Heritage site. 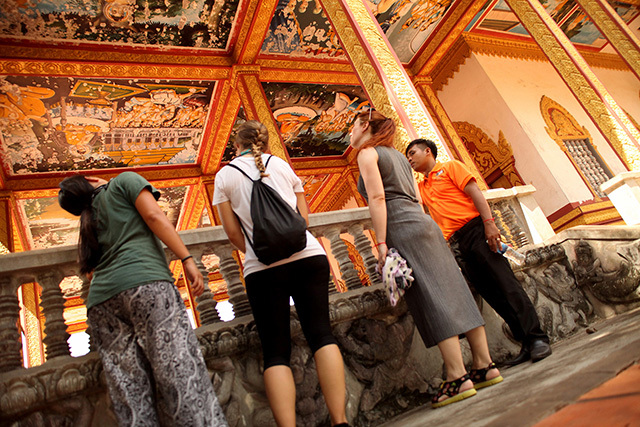 Once the sun has done its thing we then venture into the world’s largest religious building for a guided tour. This is followed by a tasty breakfast (local or western) and a fresh coffee. 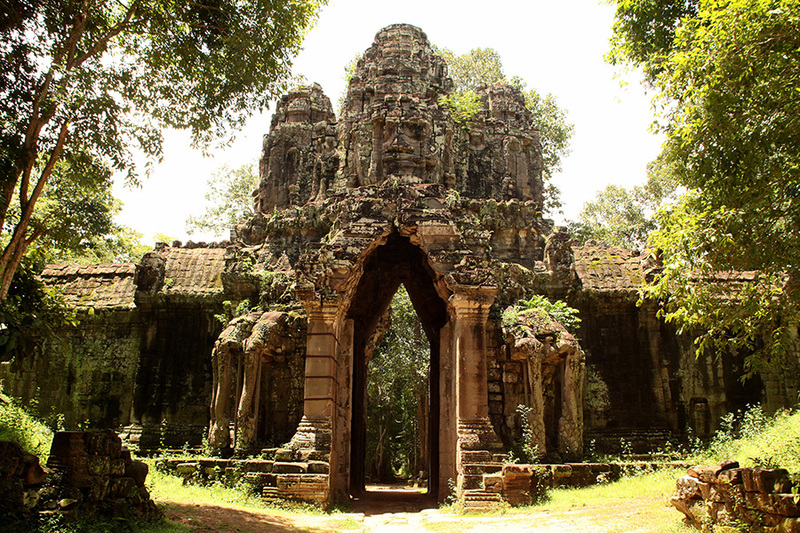 We then continue to the walled city of Angkor Thom, the Bayon and Ta Prohm (the “Tomb Raider” temple), as well as some lesser known gems. 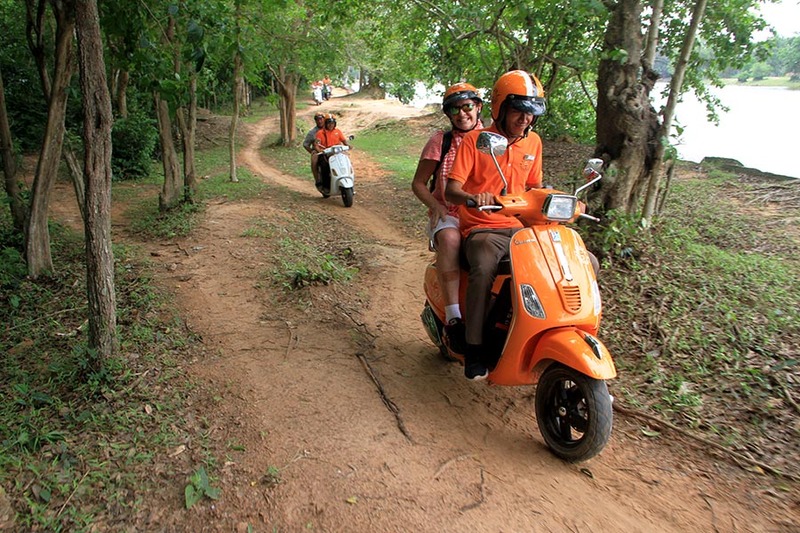 We dodge the big buses by leaving the busy roads behind using hidden trails through the jungle, villages and rice fields – a unique experience that visitors on 4 wheels simply cannot recreate! We then return you to your hotel in time for lunch, with the rest of your day to enjoy! 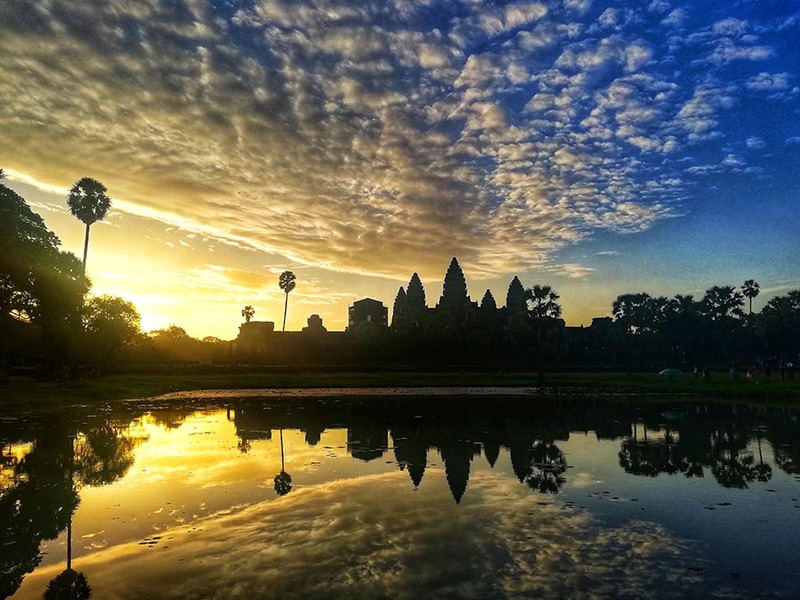 *Angkor Wat Sunrise Tour Highlights* – Sunrise at Angkor Wat, breakfast, off the beaten track temples, Baksei Chamkrong, Angkor Thom, Bayon temple, Ta Prohm, local village, Angkor Wat. 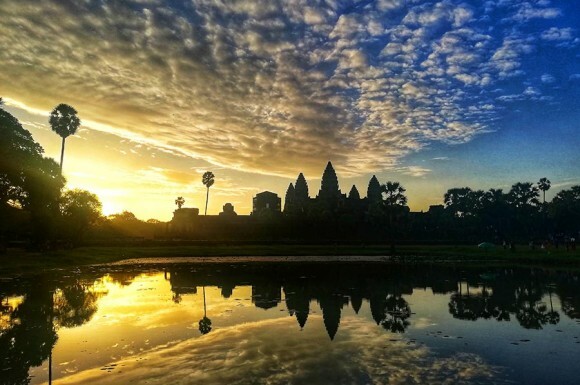 Angkor Wat is a magical place. Let us share our story with you about life growing up in the shadows of this amazing temple complex. 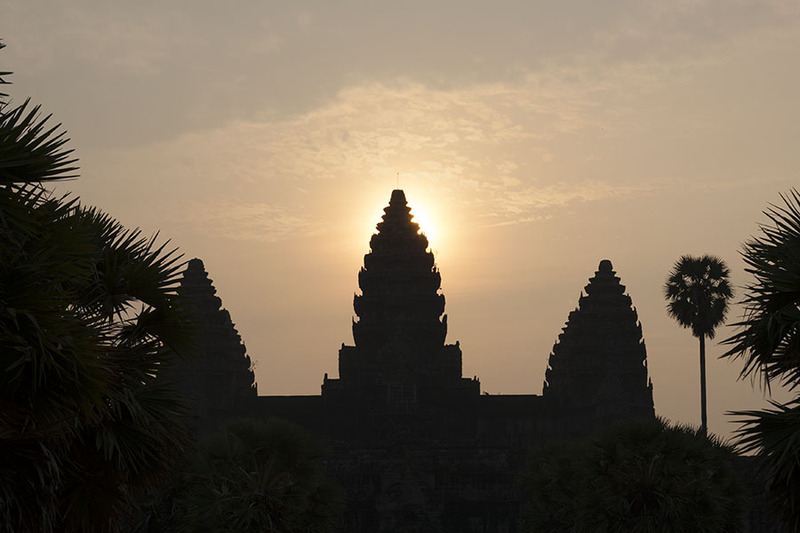 You’ve done the highlight temples, now go beyond for a truly magical Angkor experience. 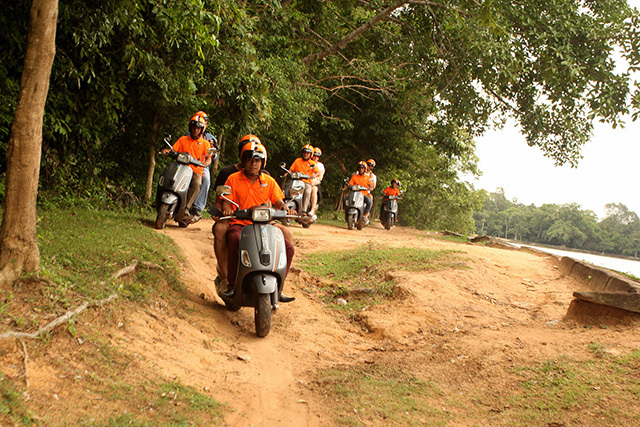 Let our Vespas take you on a journey of adventure and discovery as we travel deep into the jungle in search of the hidden secrets of Angkor. 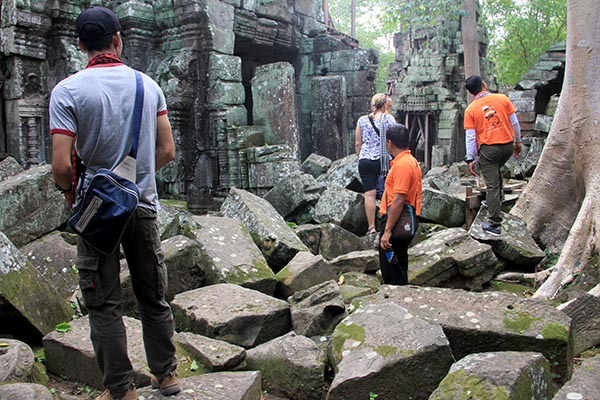 This exciting tour is perfect for those who have done the highlights and now want to experience the true mystic of Angkor even further from the crowds. 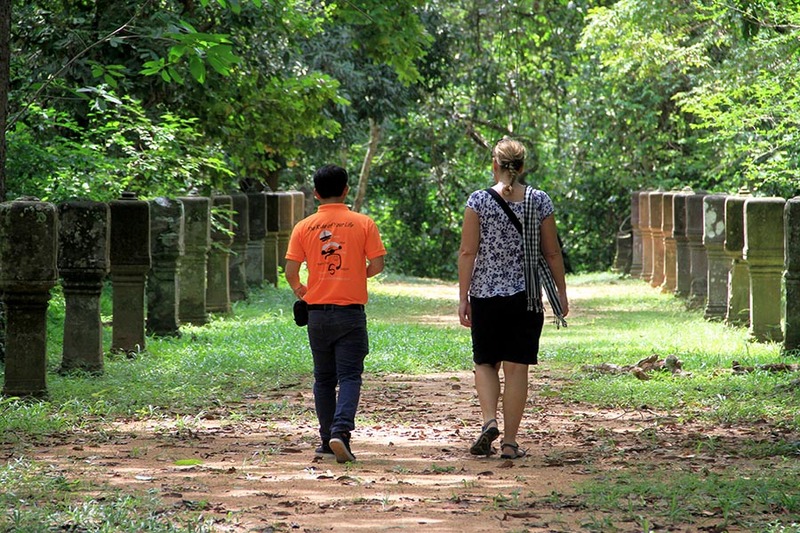 We follow lost paths and hidden trails to take you on a journey that spans the 400-year temple building history of Angkor. 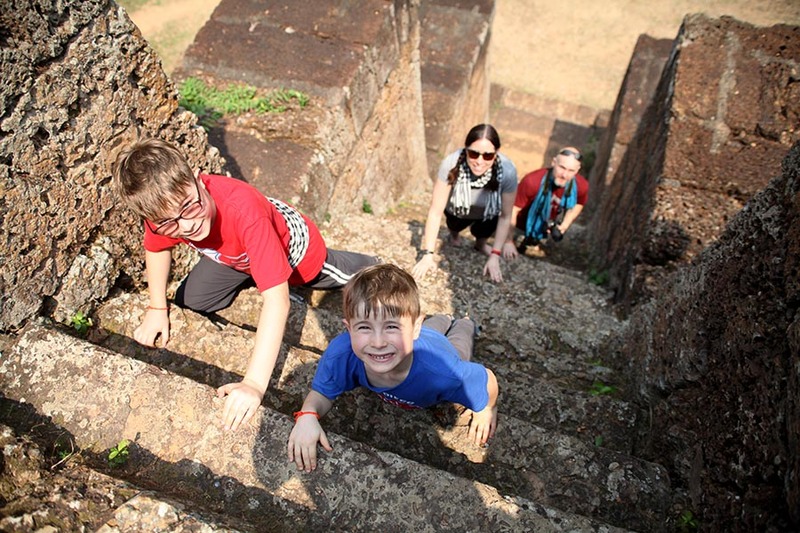 We start at the original Mountain Temple of Angkor. The stunning panorama helps us to understand why the king relocated his capital to this location. This is the only view where one can see Angkor Wat itself protruding from the jungle. Our Vespas act as time travelling machines as we whizz you from the first built temple, through the jungle, past hidden temples and ancient cities, across a suspension bridge until we arrive at the Terrace of the Elephants, built by the most famous and last of the temple building kings Jayaverman VII. 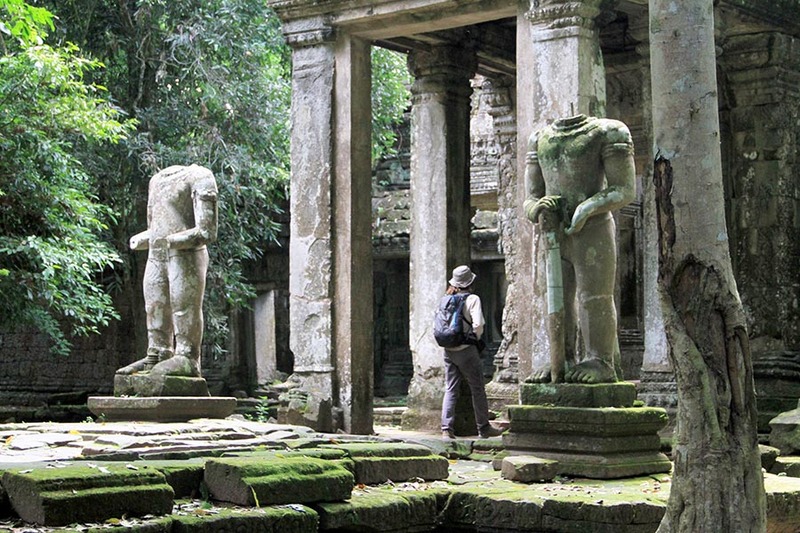 It is an absolute must for those seeking a truly unique and magical Angkor experience off the beaten track! 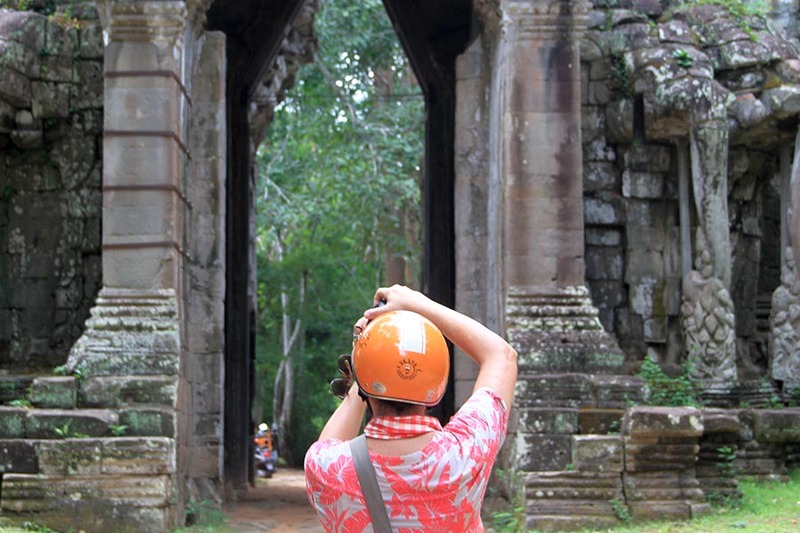 Note: This tour is a little more adventurous than our original Angkor Tour and requires some light-moderate walking. * Highlights – Discovering hidden temples on secret jungle trails, Phnom Bakheng Mountain Temple, Walled city of Angkor Thom, Gate of Death, Secret forest temple, Picnic lunch overlooking flooded forest, Preah Khan Temple, ruin discovery forest walk, Terrace of the Elephants. 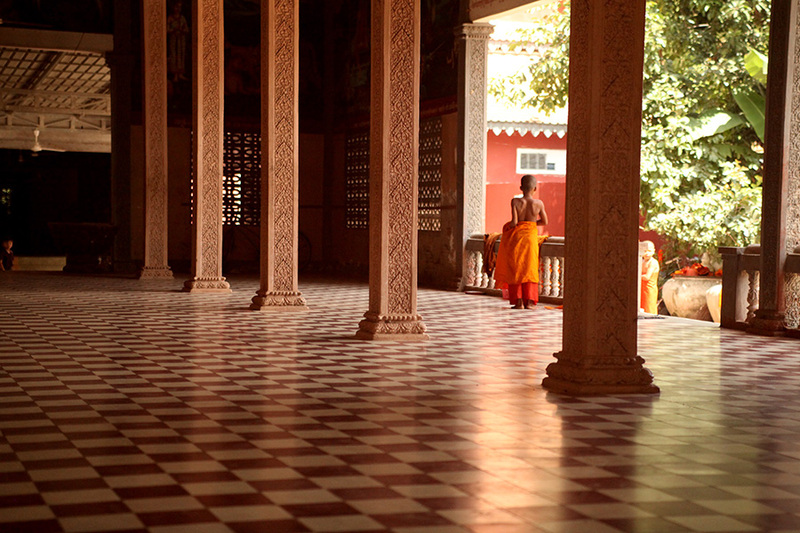 Take a break from the temples and journey with us to the shores of the Tonle Sap Lake. This adventure offers a fascinating insight into the unique living styles in one of Cambodia’s stilted and floating villages. 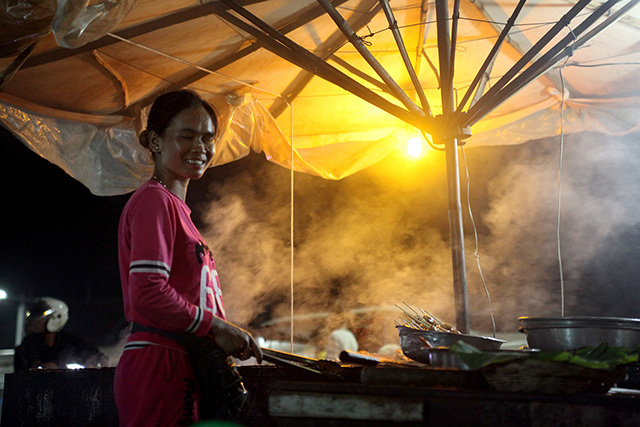 Discover the unique way of life of those living on South East Asia’s largest Lake! 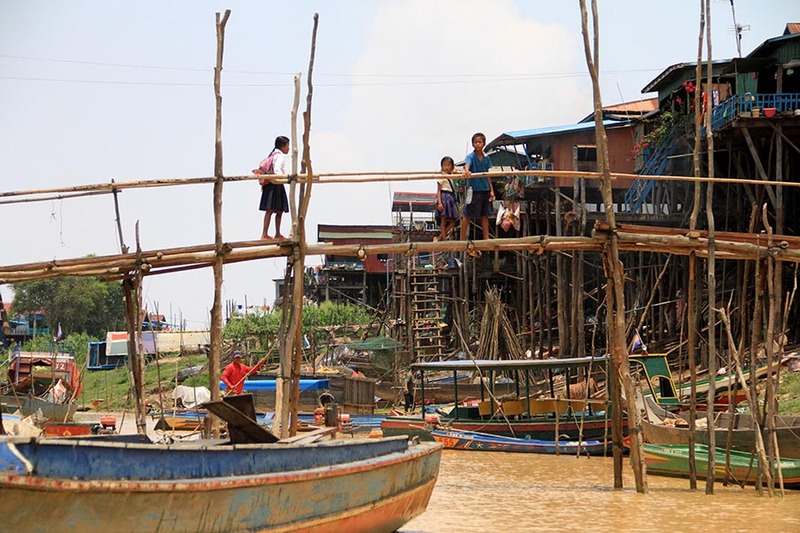 This tour offers a unique experience of visiting the stilted village on the Tonle Sap Lake. Recognized as a UNESCO Biosphere Reserve the Tonle Sap is the largest lake in Southeast Asia. 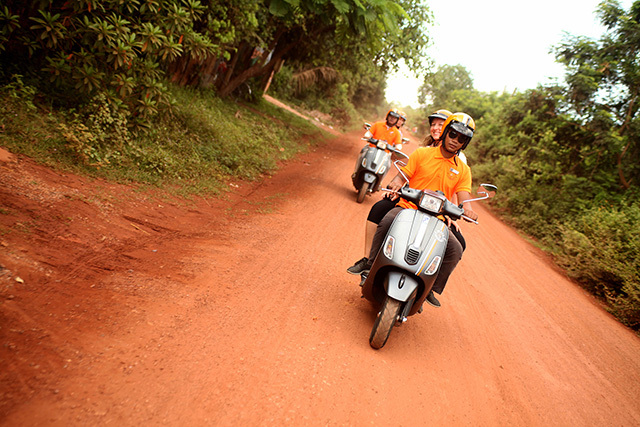 We travel on red dirt roads through some of Siem Reap’s most scenic countryside. We pass through what was once the ancient Kingdom of Hariharalaya that predated Angkor. We leave our trusty Vespas and drivers and travel by boat through a village where the homes of the residents tower above us on 10-meter high stilts that protect from the rising water. 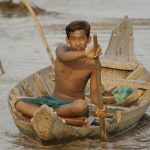 The people are fishermen, their children paddle by boat to school, pigs float in bamboo pens, and everything take place on the water (and dry land in the dry season). 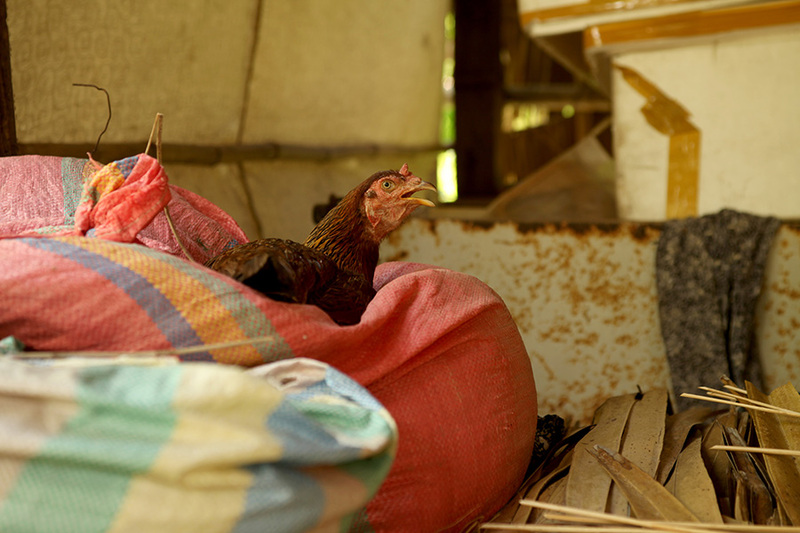 We stop to visit a local family and enjoy a home-cooked lunch. We then leave this fantasyland behind as we re-join our Vespas. 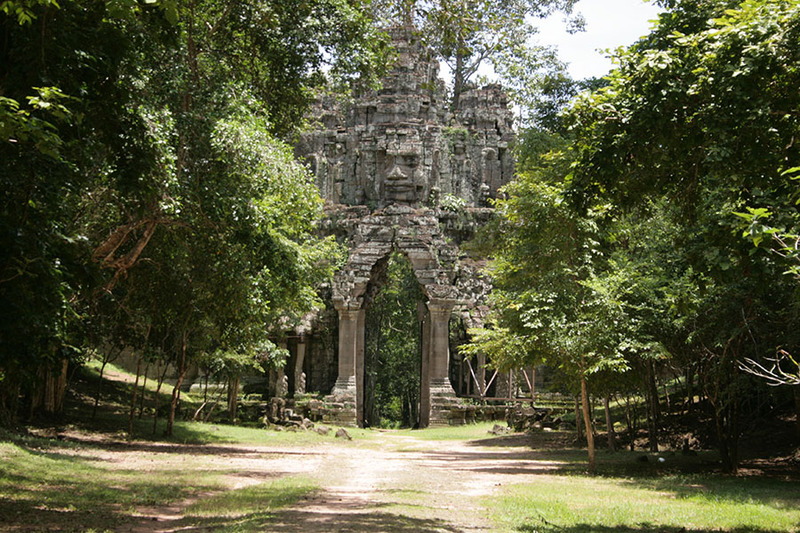 Our last stop takes us to an ancient temple hidden in the forest before we return to the city. Note: The village itself is equally impressive in wet and dry seasons. In the wet season the water is higher and clearer, this time we travel mostly but boat. In the dry season the water levels are lower and muddier but we are able to travel by boat and walk around the village. 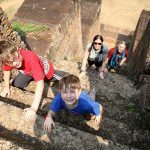 * Highlights – Riding through beautiful countryside, village stop, local market, boat trip through stilted village, Tonle Sap Lake, home cooked lunch in stilted family house, secret temple in the forest. 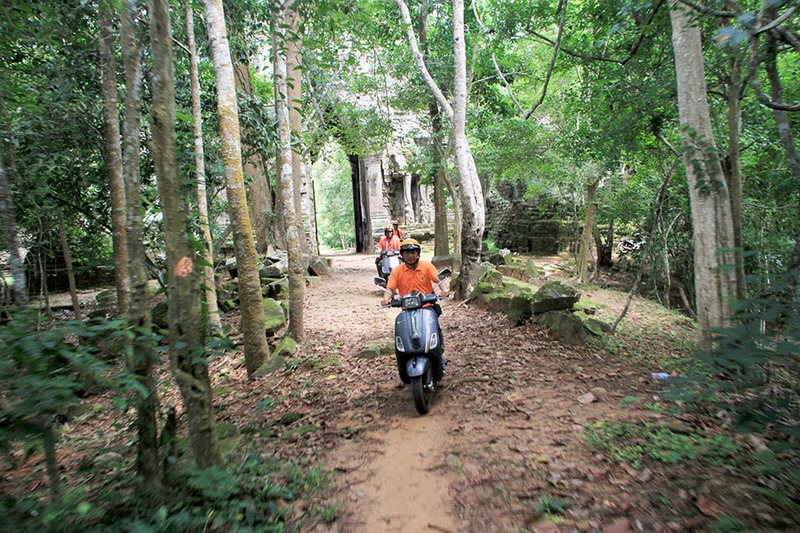 Tags: bike tour angkor wat, bike tour cambodia, siem reap tour, vespa adventures, vespa tour cambodia, vespa tour siem reap. 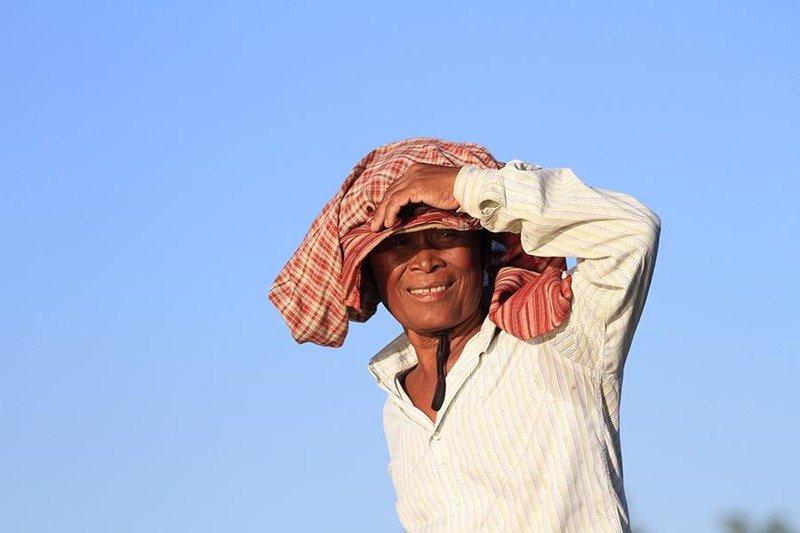 Take the Countryside Life Tour to experience the authentic Cambodia. 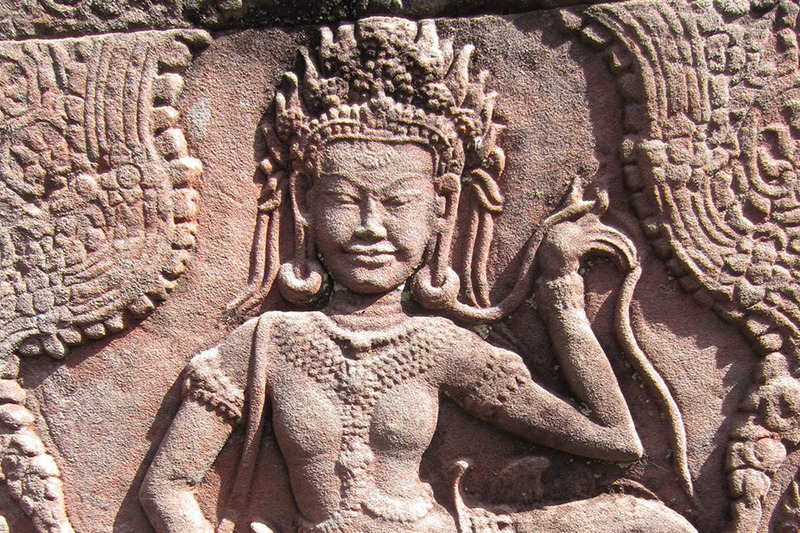 This adventure celebrates Cambodian life and culture. 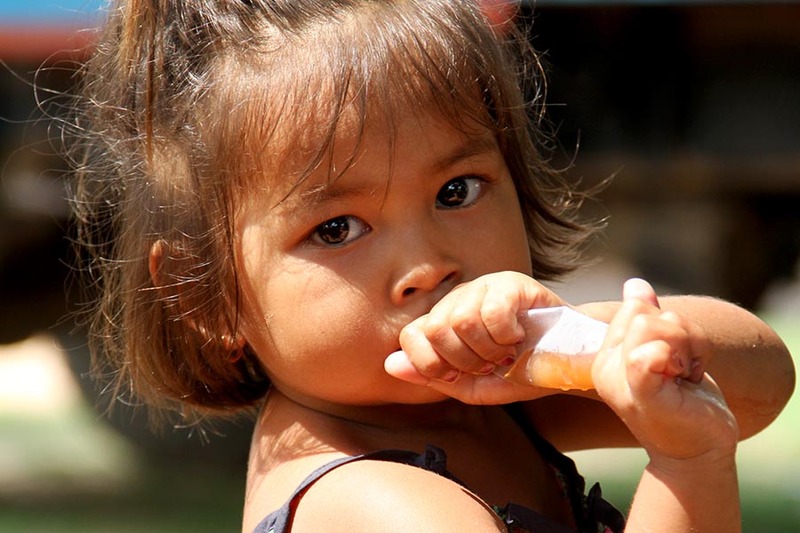 Learn about the daily life and get in touch with the spiritual side of the Khmer people. 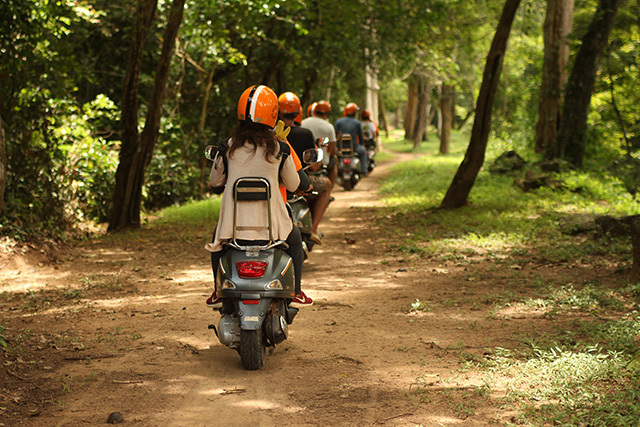 Escape the tourist hub of the heritage town and take to the beautiful countryside that exists in the shadow of Angkor Wat, riding pillion on our modern Vespas. This insightful tour with a local flavor opens up a vast and varied landscape of colorful village, country and rural life almost too remote to reach any other way! We start the tour at APOPO, a landmine clearing organization that’s uses Hero Rats to sniff out the deadly explosives. 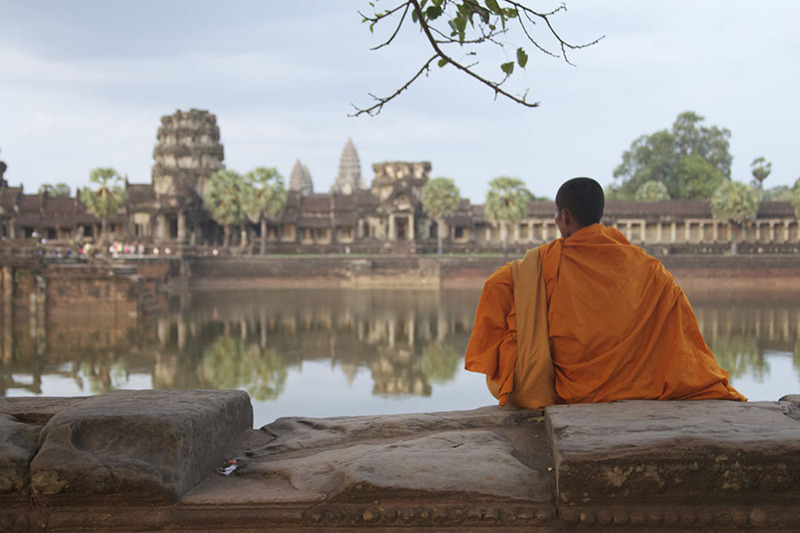 Then we’ll take you to stunning and peaceful pagoda, teach you about Khmer spiritual belief systems, and organize a Buddhist blessing. 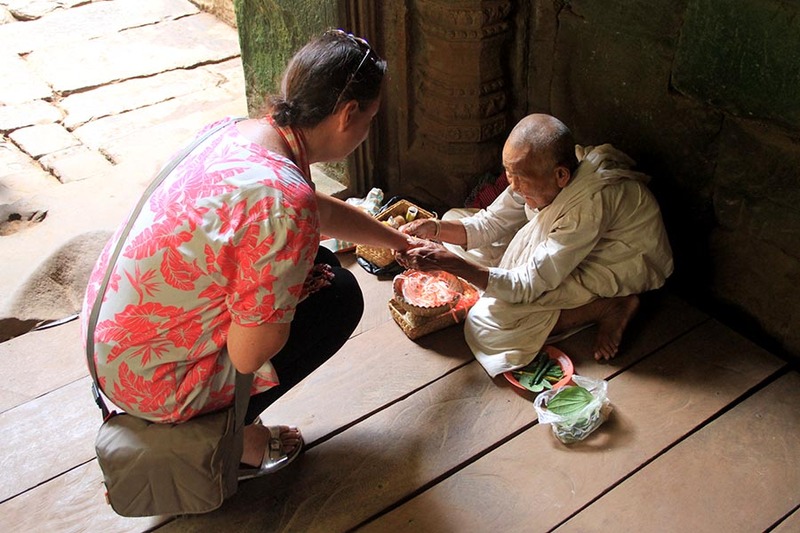 We’ll then meet the locals and gain a fascinating insight into the patterns of daily life that have changed very little since the time of the temples. 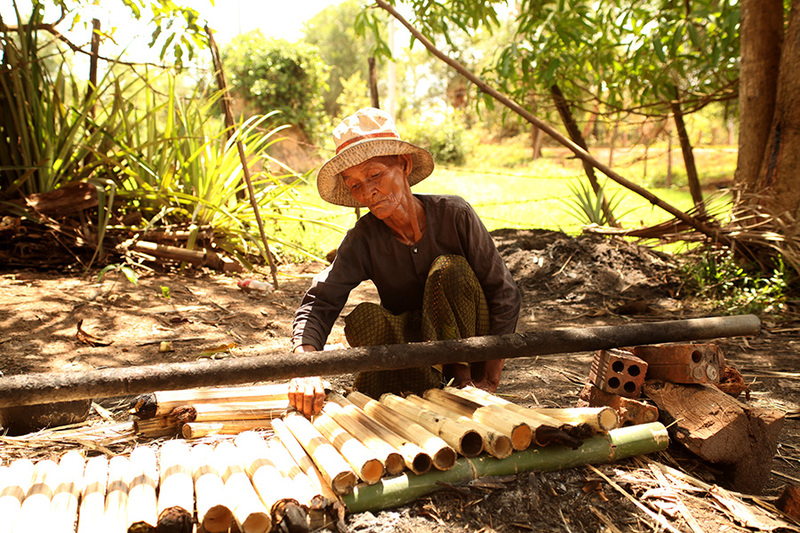 We’ll taste delicious sticky rice grilled in bamboo, meet a local medicine man, and much more! This day tour is off the beaten path, so you’ll find that there’s rarely another tourist in sight. 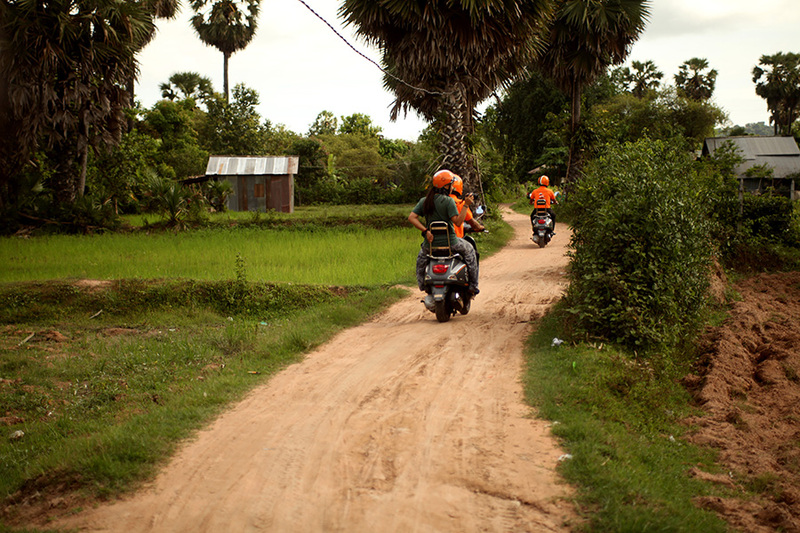 We stop at a local family house surrounded by rice paddies. 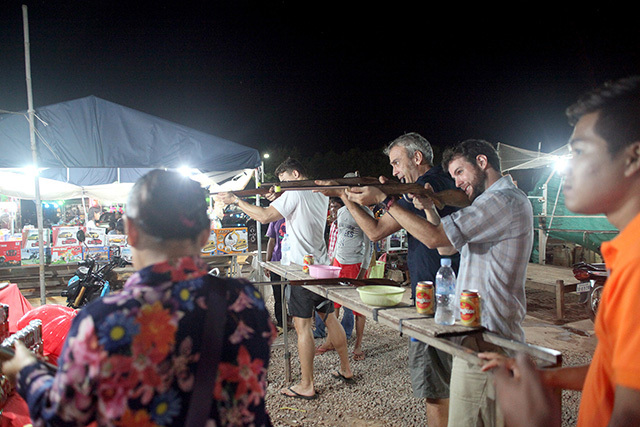 Here we sip on a cold coconut or a local beer, meet the family and spend time with their friendly water buffaloes before returning to the city. You’ll definitely return with a smile! 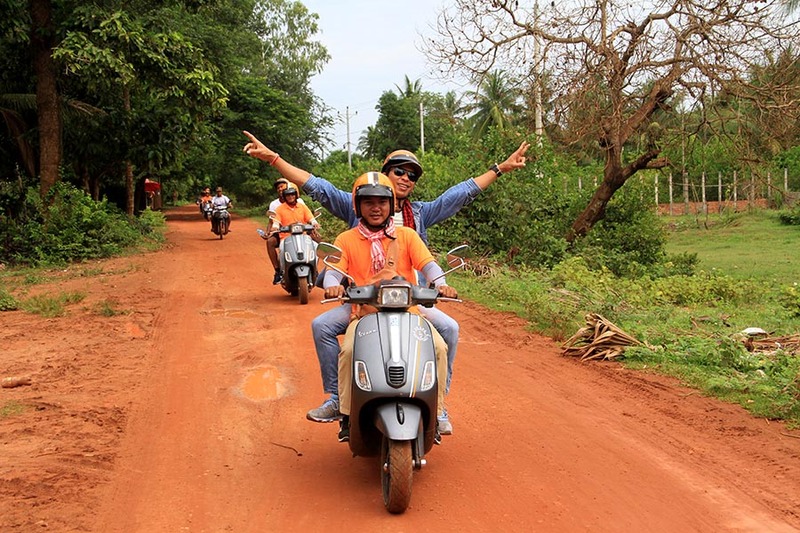 *Highlights – APOPO HeroRats, Local market, remote Buddhist pagoda, spiritual blessing by monk, ancient Angkorian reservoir, sticky rice in bamboo producer, traditional Cambodian medicine man, local refreshments in family house, Rice noodle maker, riding through the countryside on our stylish Vespas. 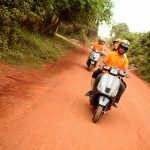 Tags: real siem reap, siem real local life, siem reap bike tour, siem reap countryside, siem reap countryside tour, siem reap motorbike tour, siem reap people, siem reap tour, siem reap vespa tour. 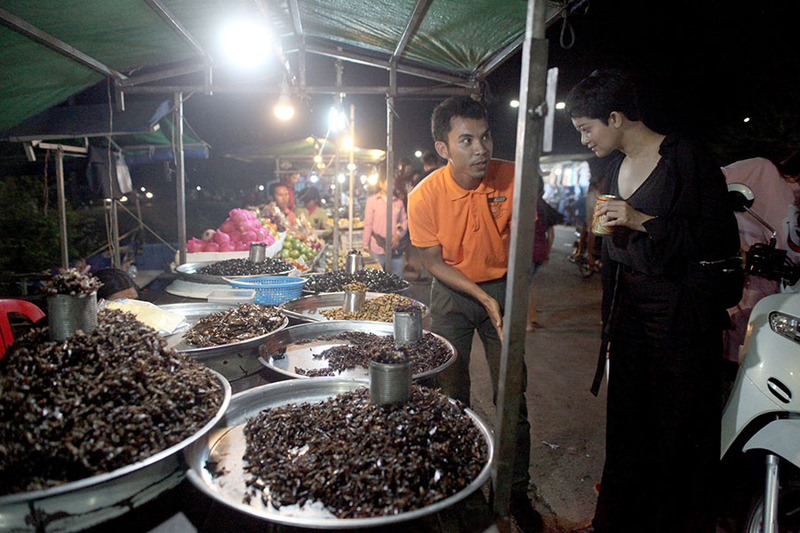 Take the After Dark Foodie Tour Siem Reap to discover Khmer cuisine. 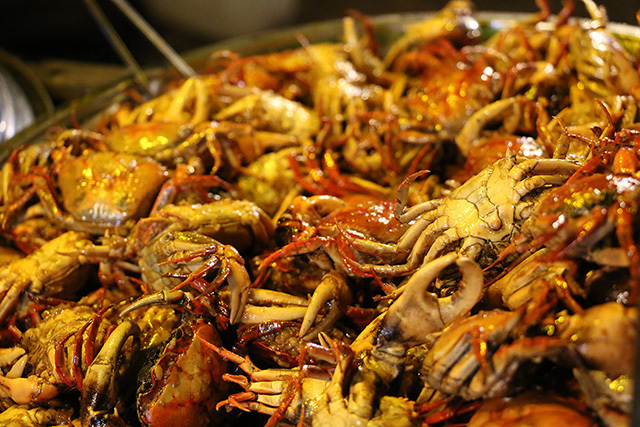 This tour is the adventurous gourmet’s paradise. 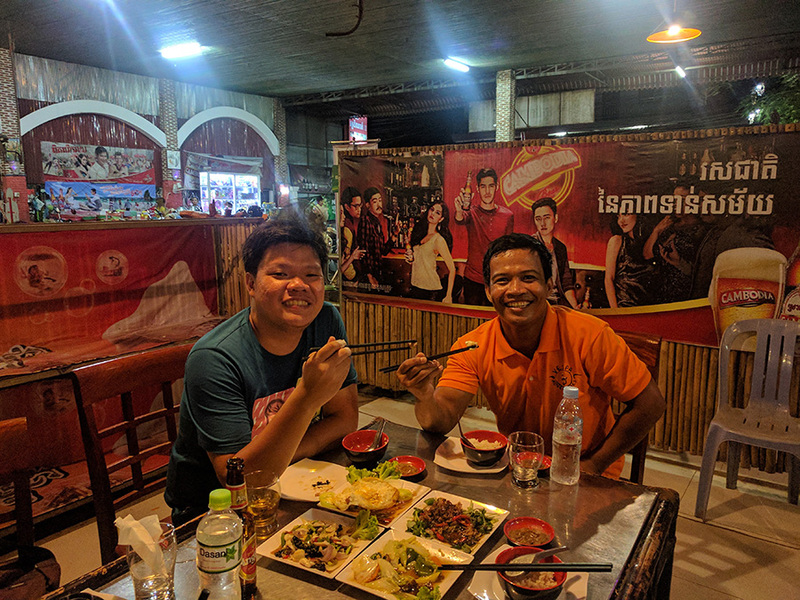 After spending the day visiting Angkor Wat, this exotic food & brews tour will show you what Cambodian culture and cuisine is really like. 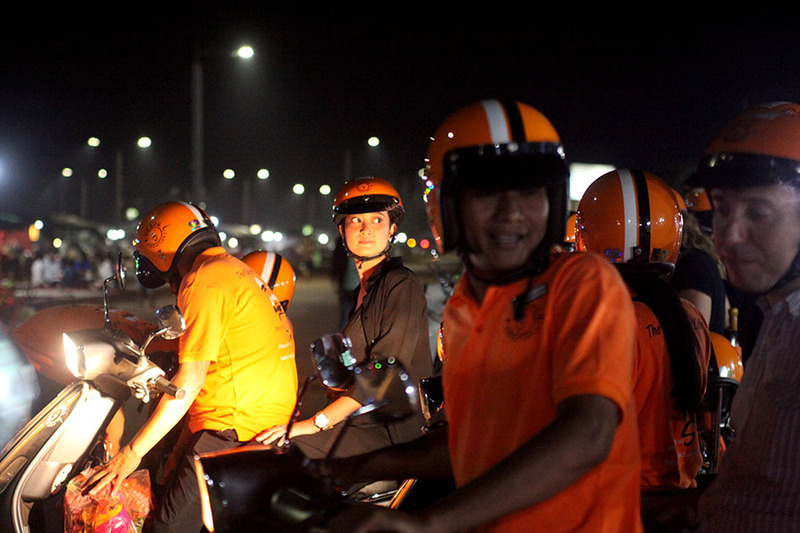 You have spent your day in and around Angkor, but how is the real Siem Reap After Dark? This foodie adventure is an experiential roller coaster through the vibrant Siem Reap dining and social scene mixing high end with real local style! We kick off with cocktails at one of the town’s most stylish venues as the sun sets. 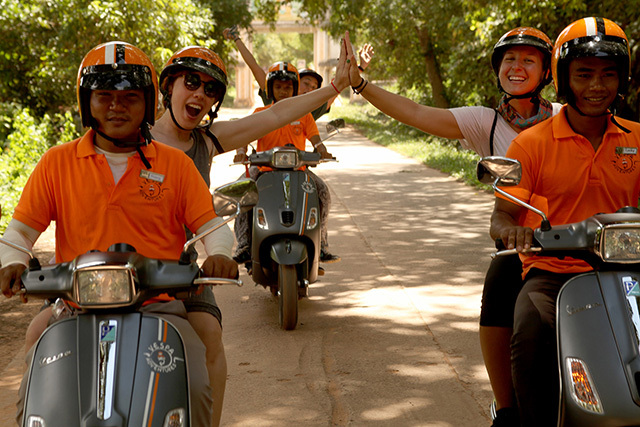 Guests then ride pillion on our jazzy modern Vespas along the Siem Reap Riverside to an evening local market to gain an insight into fresh Cambodian ingredients. 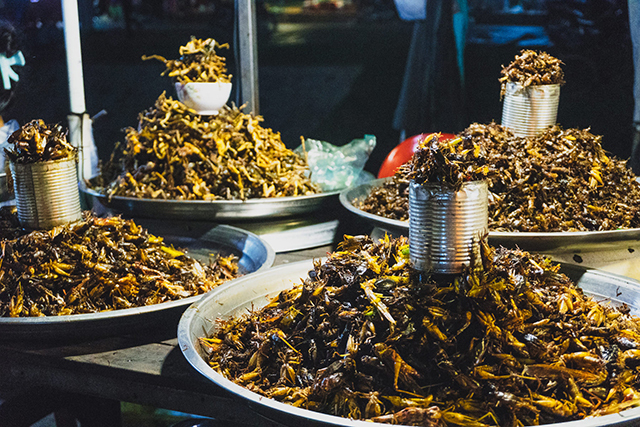 We cruise through the busy streets of this ancient heritage town and introduce you to many aspects of Khmer cuisine – from street markets to food stalls, from exotic fruits to fried bugs (yes, bugs! ), to high end fusion drinks and classic Khmer dishes. This is a unique tour that embraces the local hustle and bustle of street markets and vendors and the accompanying sights, smells, and sounds. 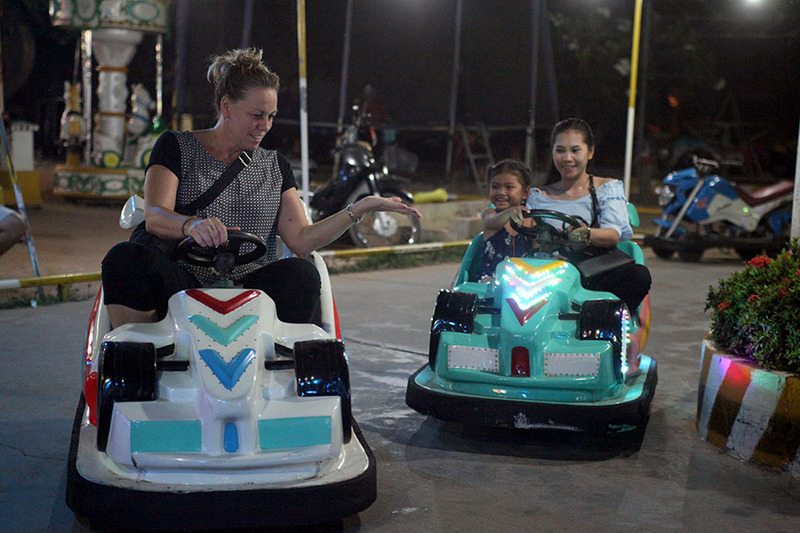 We also meet local families making merry, enjoying BBQ meats, shopping for clothes and playing games at the local fun fair. 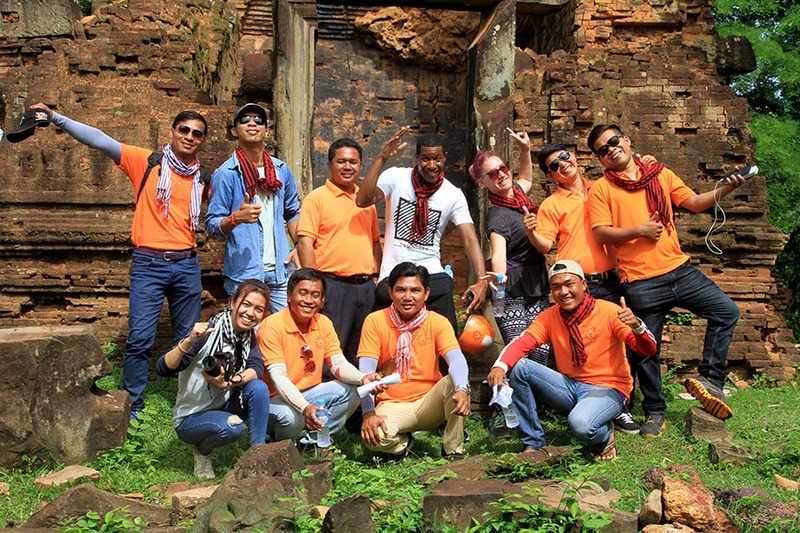 It’s a fun and varied tour that embodies the fun-loving nature of the wonderful people of Cambodia! 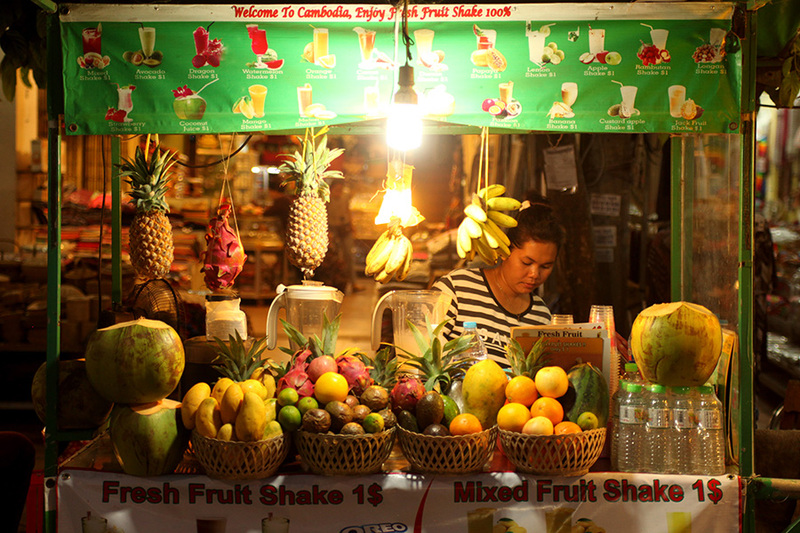 All food and drinks are included on this acclaimed Siem Reap food tour so please, bring a healthy appetite! See what AsiaLife Magazine has to say about this food tour. Also, check out what some of our recent guests have said on their blogs, Postcard-Envy & Sugar and Space! 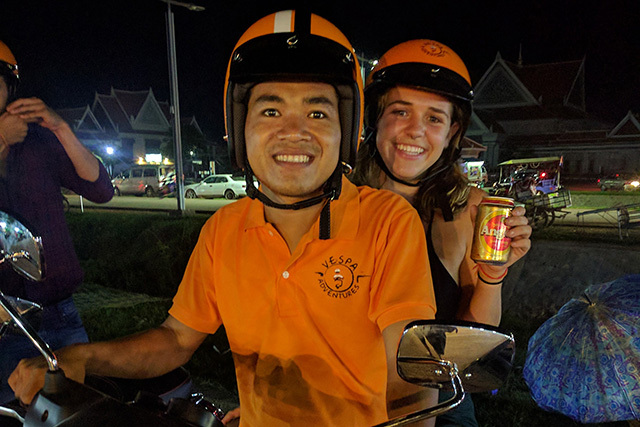 *Highlights – Stylish cocktail bar, local night market, picnic and restaurant style dining, fairground fun, infused Cambodian rice wine in funky bar, cruising the streets at night by Vespa, all you can eat and drink. Not quite the adventurous foodie? We try our hardest to accommodate most food and dietary preferences or allergies. 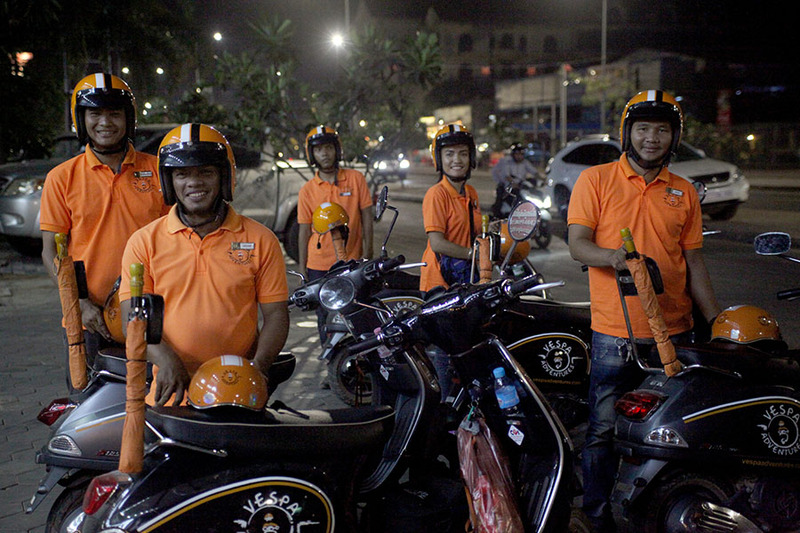 Safety is a priority for us, so all guests will ride behind our experienced guests. 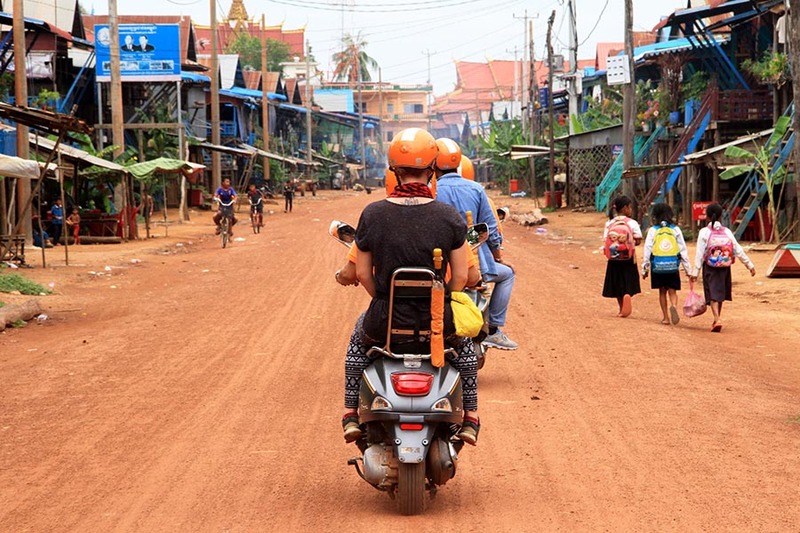 Tags: bike tour seam reap, bike tours Siem Reap, food tour seam reap, khmer cuisine, khmer food, khmer gastronomy, one night in seam reap, siem reap after dark, siem reap at night, siem reap foodie tour, vespa tour seam reap, what to do in seam reap. Travelling in Siem Reap but can't seem to decide on a tour? 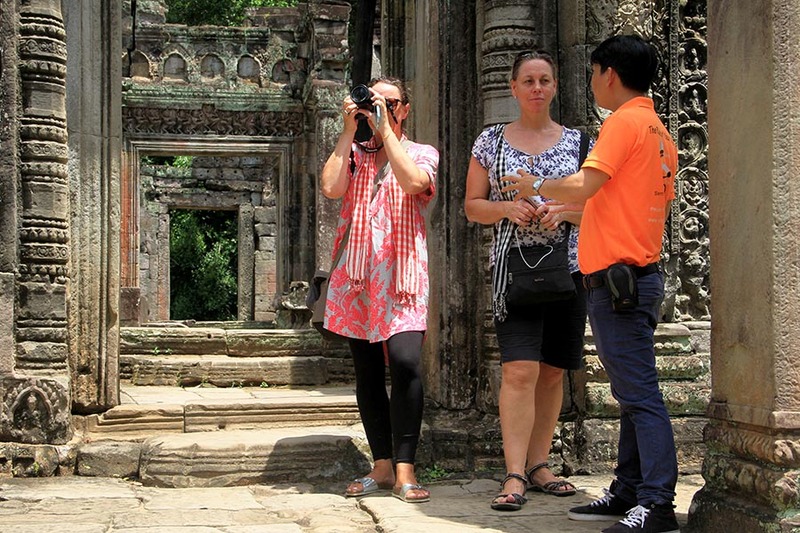 This tour package is the perfect way to experience many alternative highlights of Siem Reap. 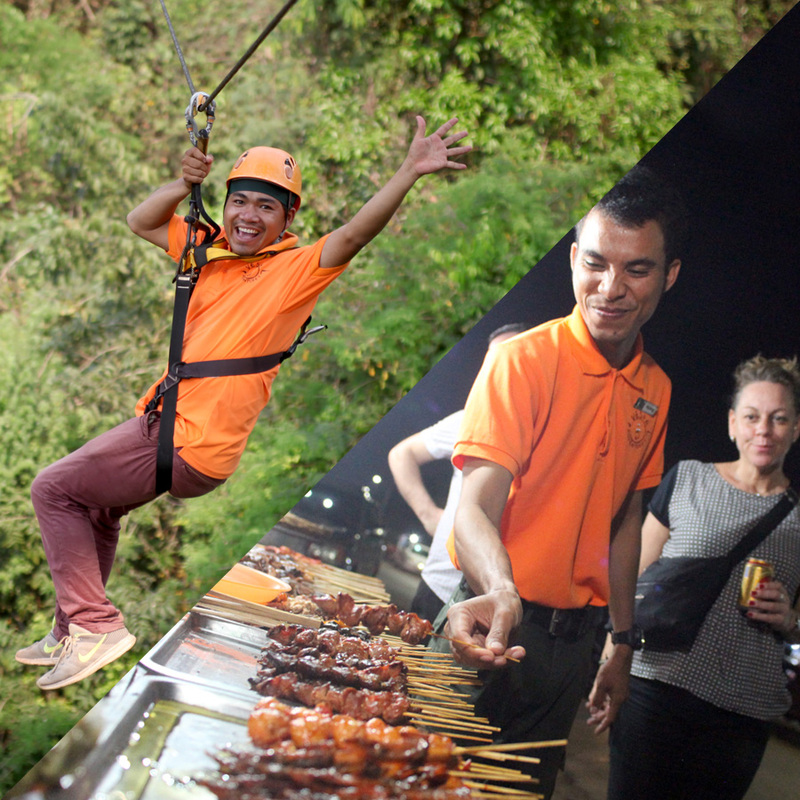 Discover the surroundings of Angkor from the tree-tops, and experience the real nightlife of Cambodians! 7.30 – 13.00 Zipline and return to Hotel. 13.00 – 18.00 At your leisure. 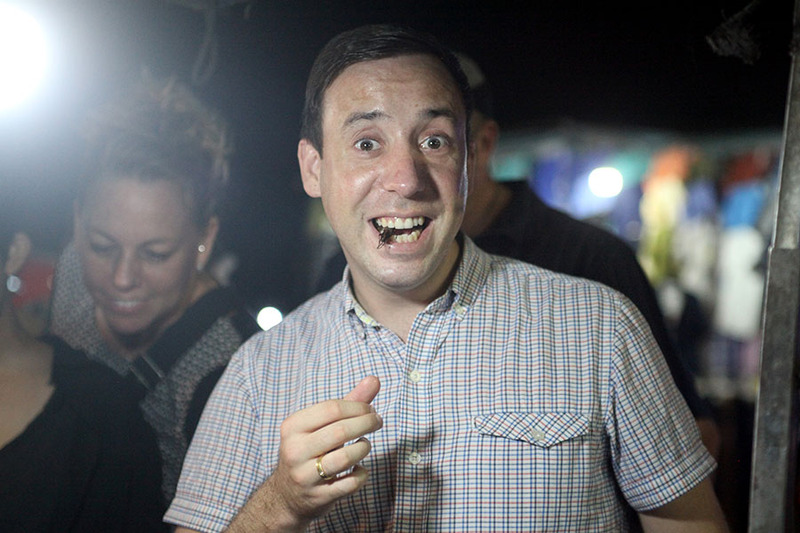 18.00 – 22.00 After Dark Foodie Adventure. 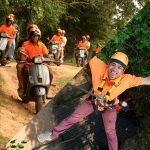 7.30 – 15.30 Zipline and return to Hotel. 15.30 – 18.00 At your leisure. 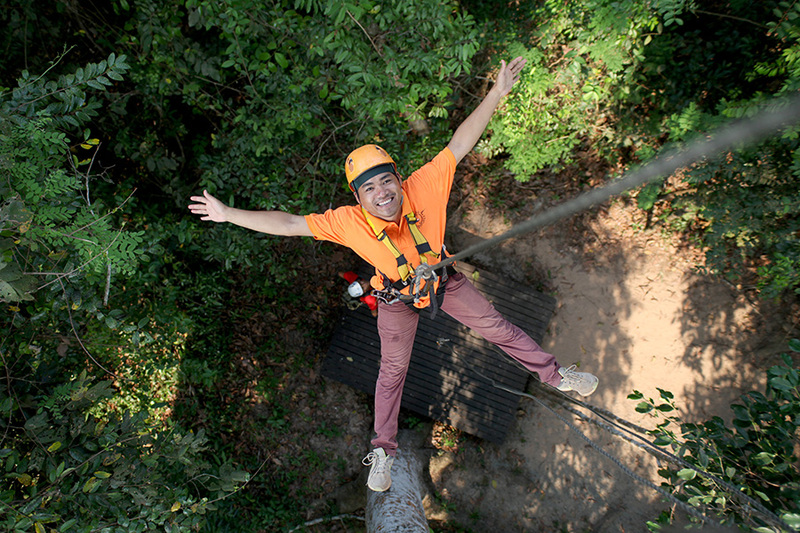 We invite you to join us in a once in a lifetime opportunity to enjoy a world-class zipline deep in the ancient forest at the famous Angkor Zipline. 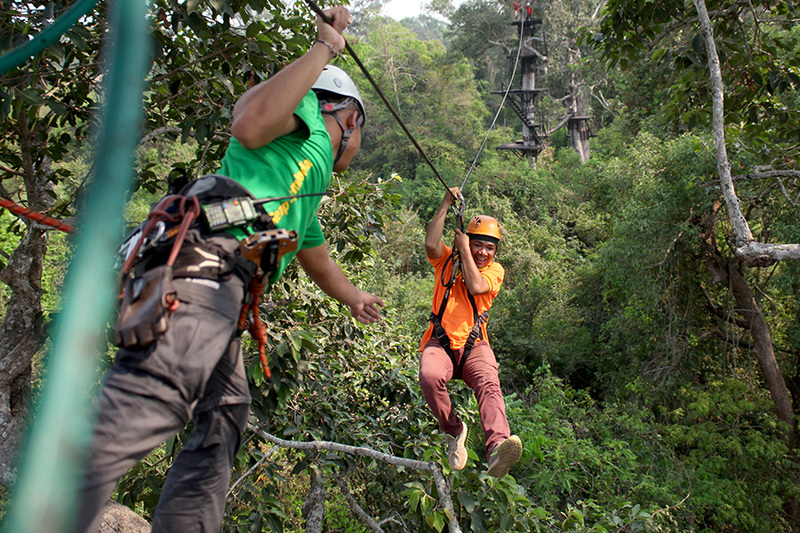 We climb up into the canopy of this spellbinding forest and literally “fly” through the tree tops! 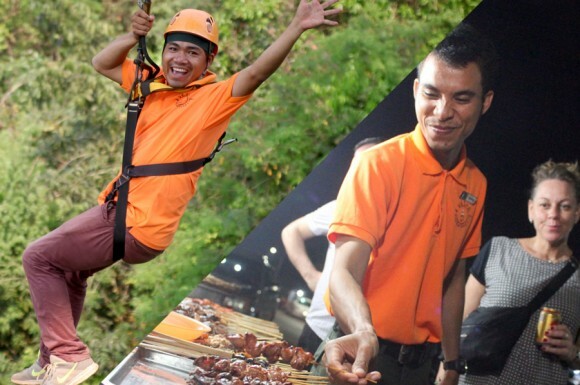 The zipline meets the highest international standards in design, equipment and management. The views over the forest are simply breathtaking and the only noise is the calls of the birds and, if you are lucky, you may even hear the calls of the resident Gibbons. 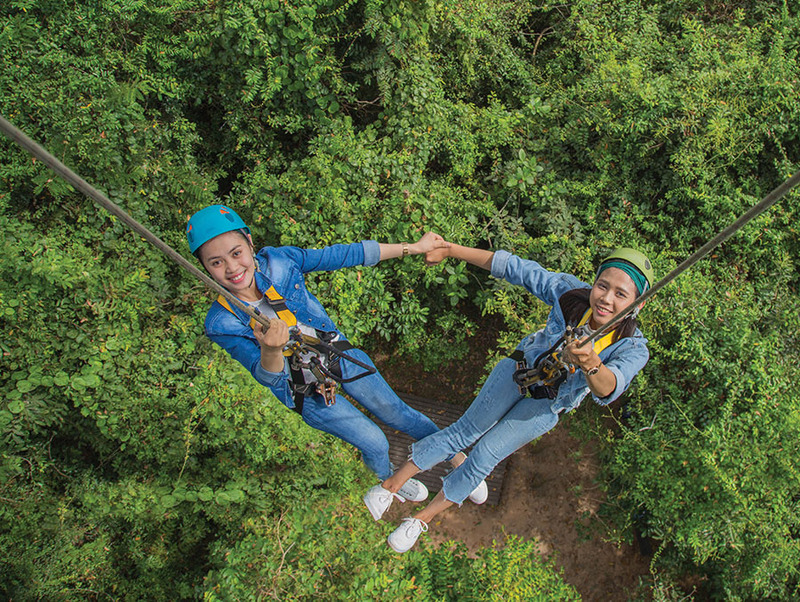 Two certified Sky Rangers will lead you and your group of no more than 9 guests on a breathtaking, but totally safe, journey. We promise you a rainforest eco-adventure you will never forget! 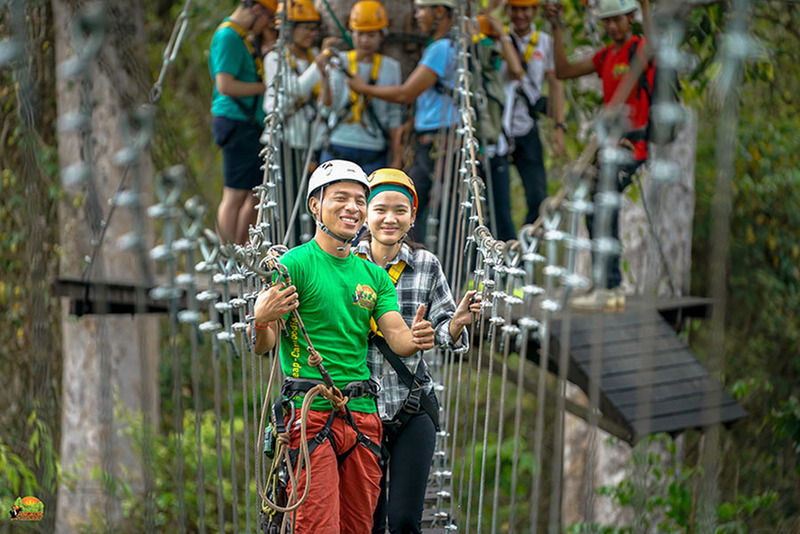 In this combination we offer Angkor Zipline’s “Silver Course” which includes 3 Single Ziplines and 1 double zipline, 2 suspended sky bridges, 1 Spiderman bridge, and a short guided nature trail at the end of your zipline experience. 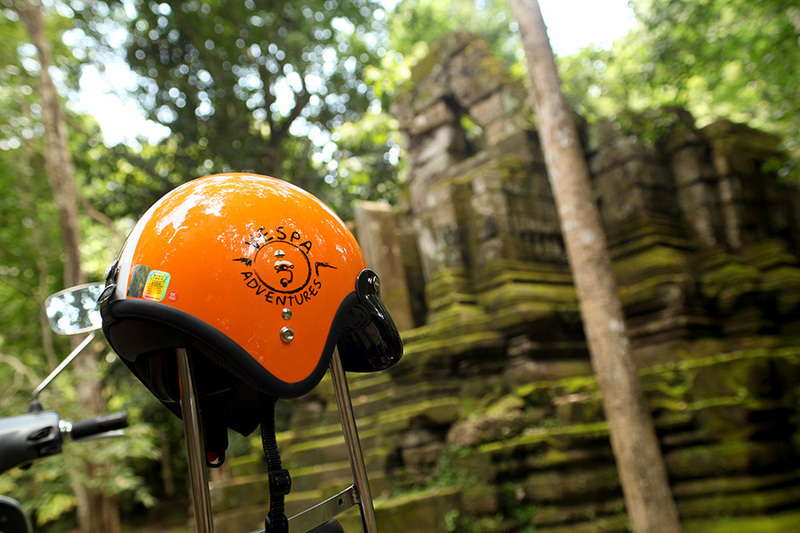 You will then be returned to your hotel with plenty of time to refresh and reflect before our trendy Vespa pick you up at 6.30PM for an entirely different adventure on 2 wheels! 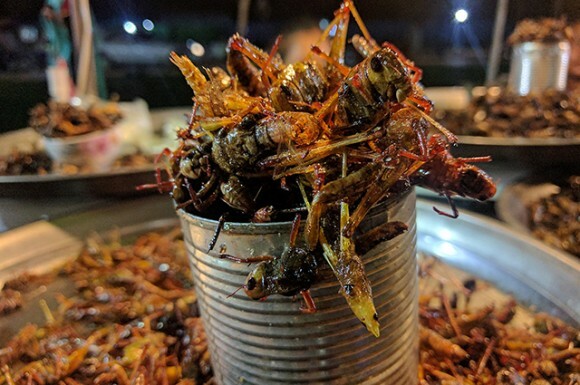 Our After Dark Foodie Adventure is an experiential roller coaster through the vibrant Siem Reap dining & social scene mixing high end with real local style! Kicking off with cocktails as the sun sets. 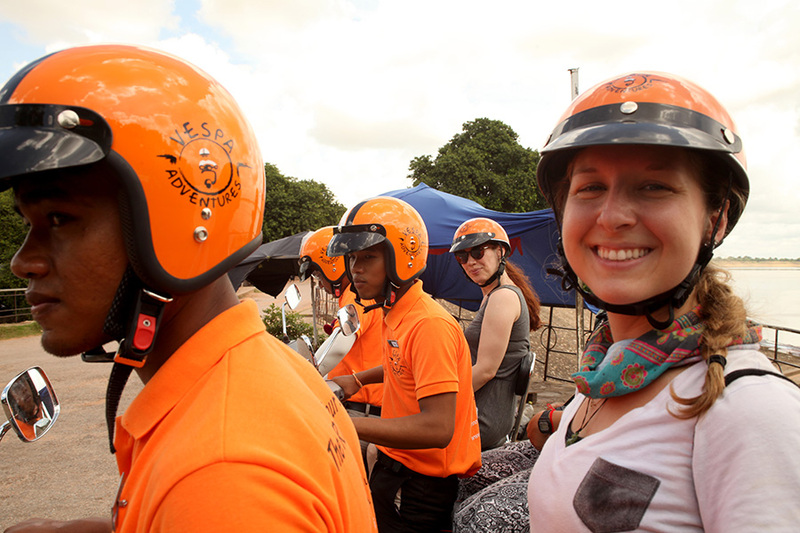 Guests then ride pillion on our modern Vespas along the Siem Reap Riverside. 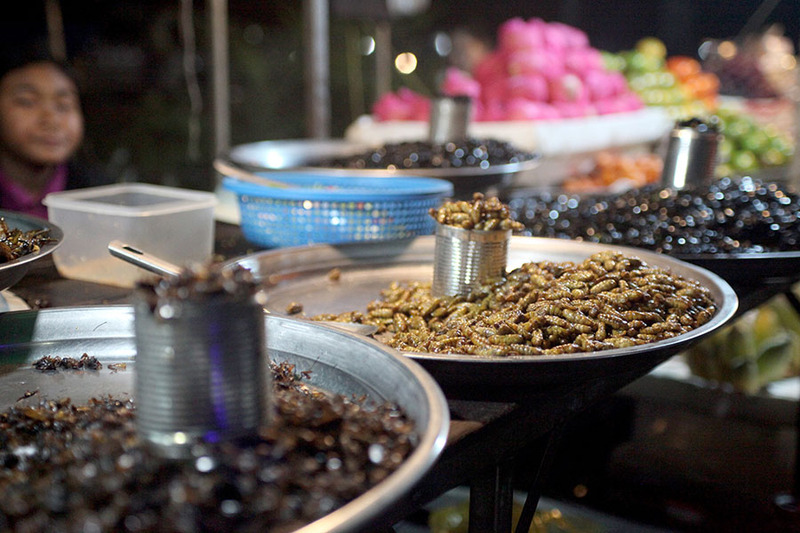 We cruise through the busy streets of this ancient heritage town and introduce you to many aspects of Khmer cuisine – from street markets to food stalls, from exotic fruits to fried bugs (yes, bugs! 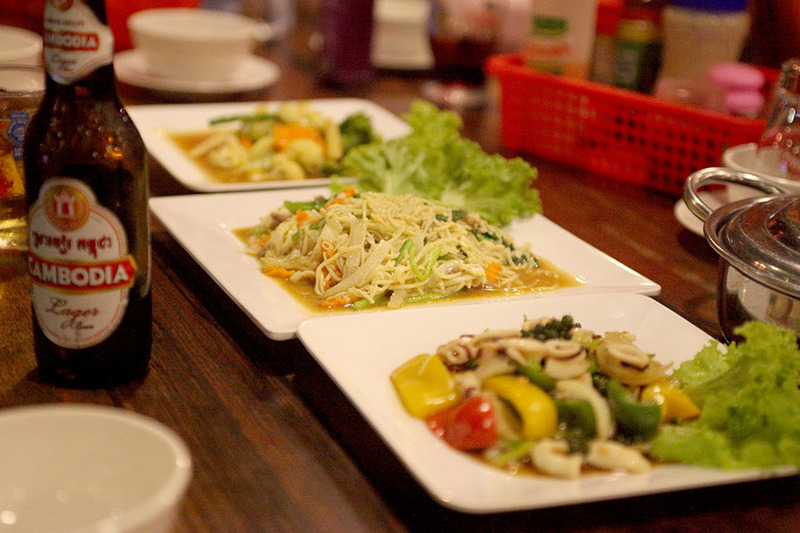 ), to high end fusion drinks and classic Khmer dishes. 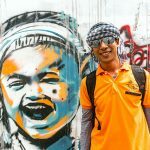 This is a unique tour that embraces the local hustle and bustle of street markets and vendors and the accompanying sights, smells, and sounds. 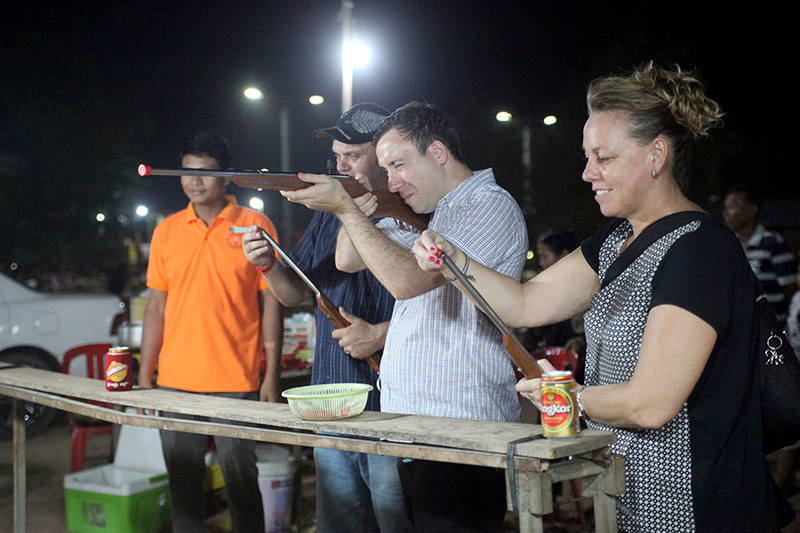 We also meet local families making merry, enjoying BBQ meats, shopping for clothes and playing games at the local fun fair. 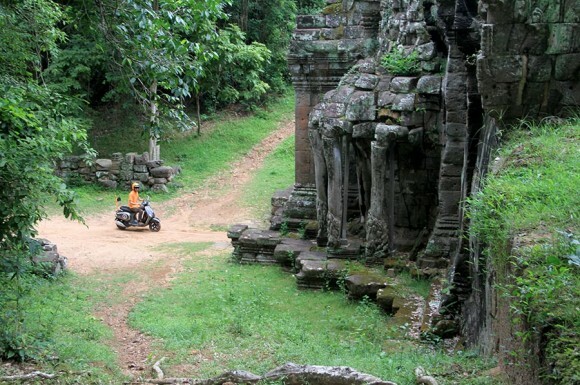 It’s a fun and varied tour that embodies the fun-loving nature of the wonderful people of Cambodia! 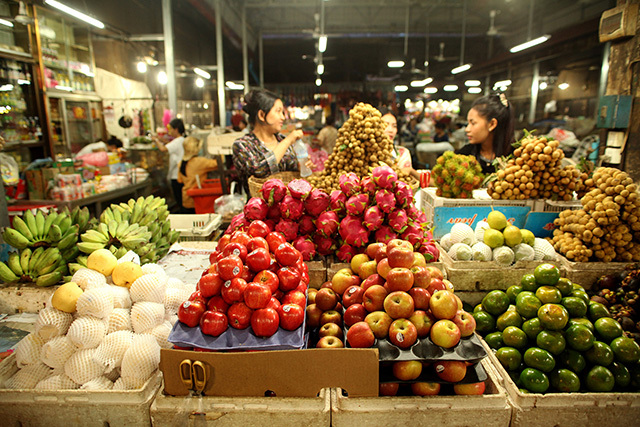 All food & drinks are included on this acclaimed Siem Reap food tour so please, bring a healthy appetite! Tags: angkor adventure, angkor foodie tour, angkor night tour, angkor tour, angkor zipline, angkor zipline foodie tour, angkor zipline tour, siem reap foodie tour, siem reap night tour, siem reap tour, siem reap zipline, siem reap zipline foodie tour. 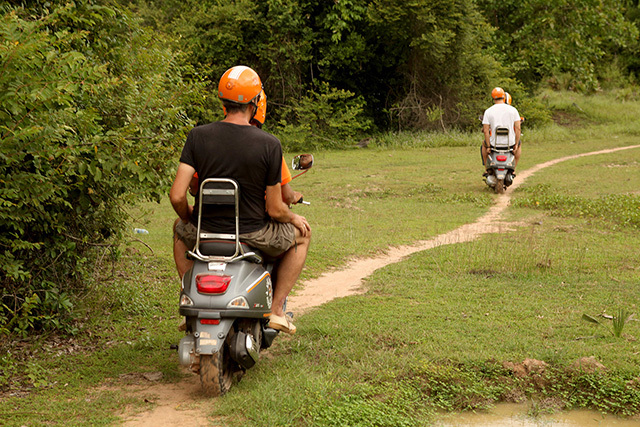 This is the ultimate way to spend your day in Siem Reap. 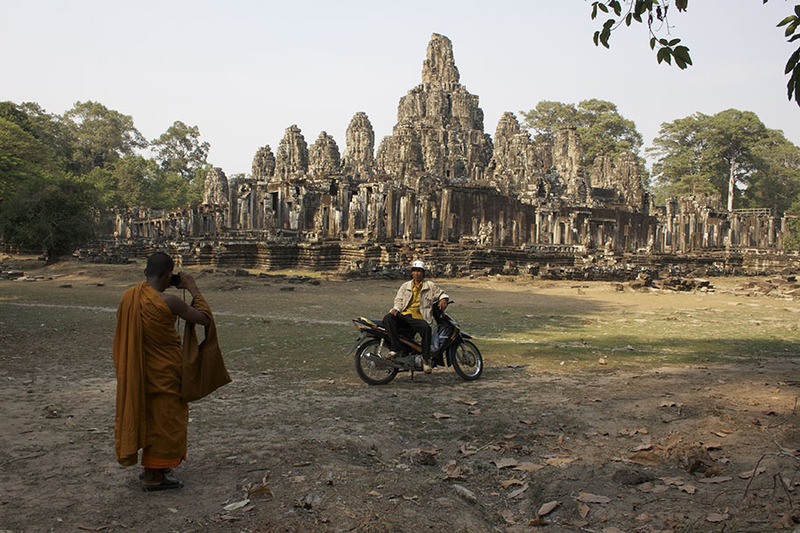 Explore the temples of Angkor Wat and then hit the unexplored roads away from the touristic paths and crowds. 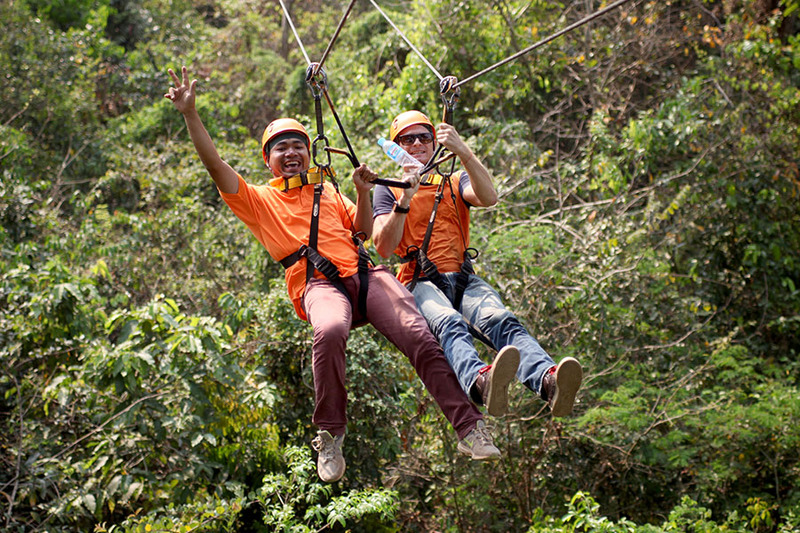 After that, get ready to discover the surroundings from the top of the trees in the amazing Angkor Zipline experience! 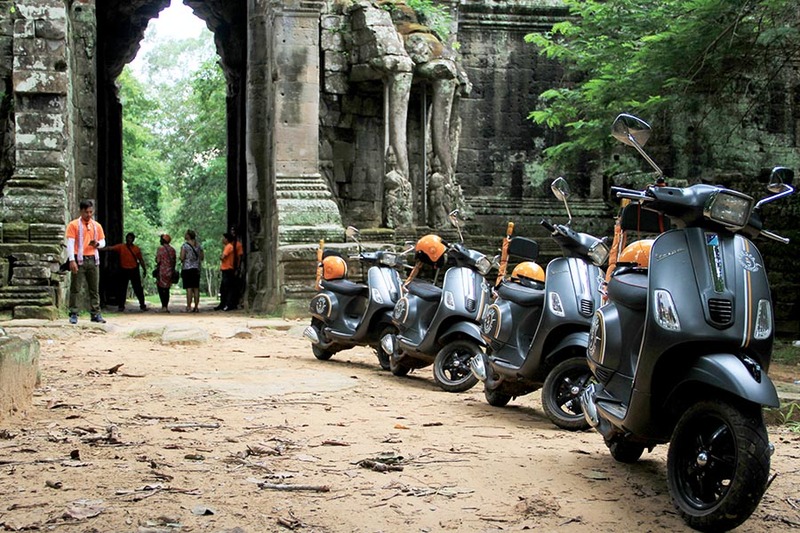 Our Vespa Tour of Angkor is fast emerging as the most exciting way to swerve the crowds and enjoy Angkor in the way it should be experienced! 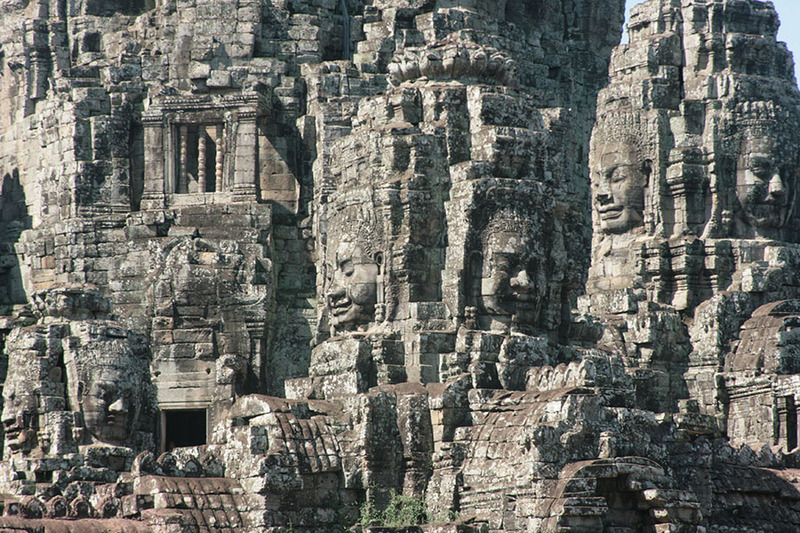 We take you to the major highlights of Angkor Wat, the walled city of Angkor Thom, the Bayon and Ta Prohm (the “Tomb Raider” temple), as well as some lesser known gems. We avoid the crowds and the big buses by leaving the busy roads behind using hidden trails through the jungle, villages and rice fields. It’s a unique experience that visitors on 4 wheels simply cannot recreate! 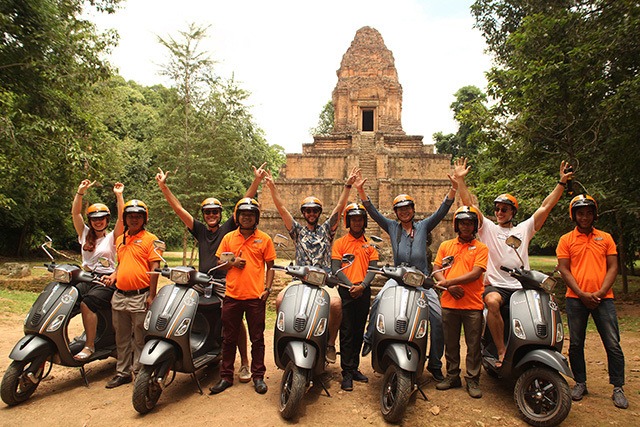 We guarantee you will love the temples, however, it’s the ride on our jazzy Vespas past ancient ruins, through the jungle and along ancient city walls that becomes the real highlight! 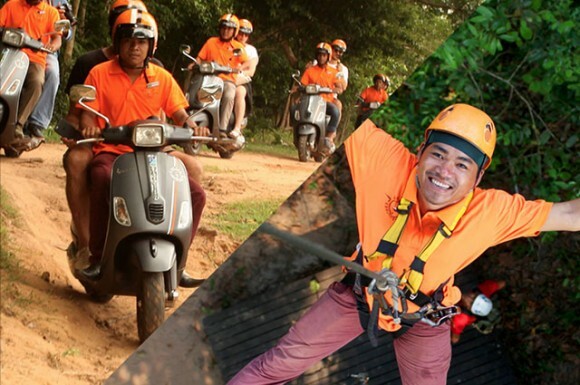 After our final temple our Vespas take us deep into the ancient forest to the famous Angkor Zipline where we climb up into the canopy of this spellbinding forest and literally “fly” through the tree tops! 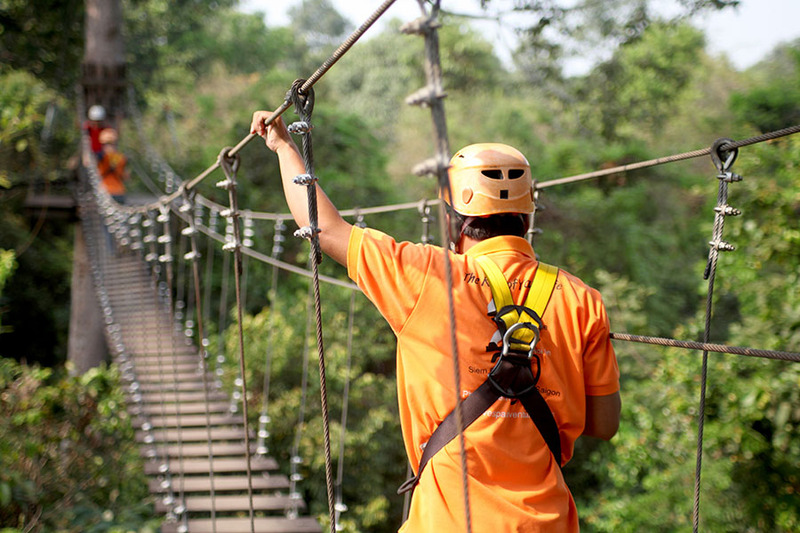 The zipline meets the highest international standards in design, equipment and management. the views over the forest are simply breathtaking and the only noise is the calls of the birds and if you are lucky you may even hear the calls of the resident Gibbons. 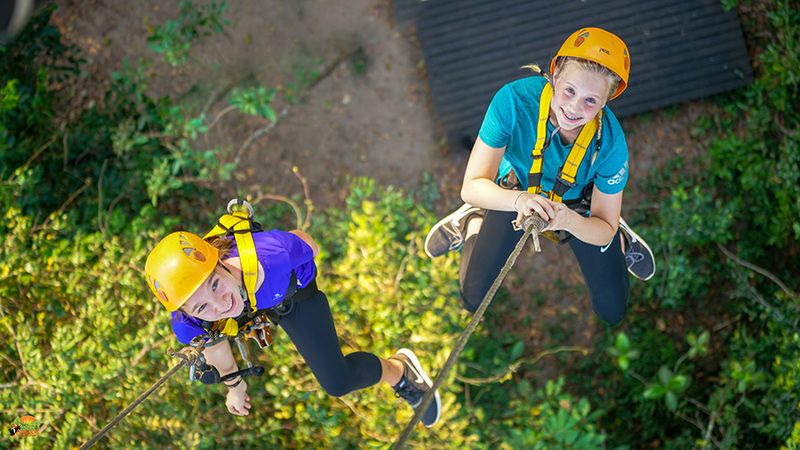 Two certified Sky Rangers will lead you and your group of no more than 9 guests on a breathtaking, but totally safe, journey. 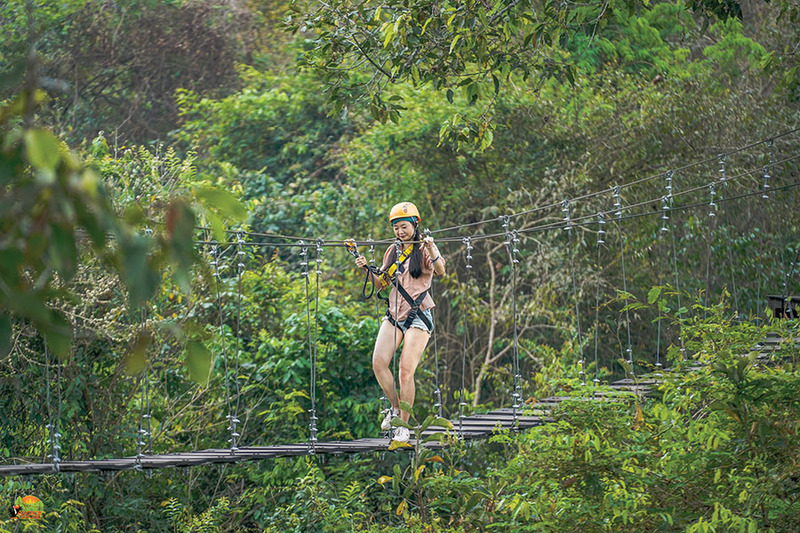 We promise you a rainforest eco-adventure you will never forget! 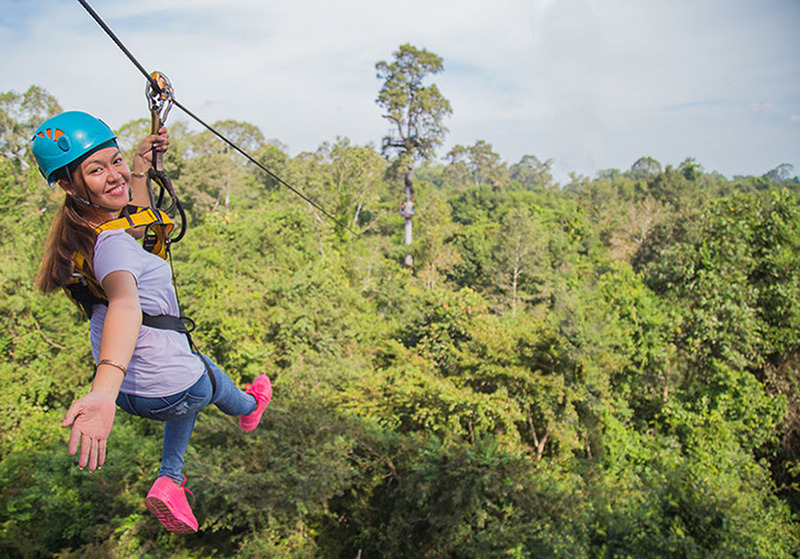 We offer Angkor Zipline’s “Silver Course” which includes 3 single ziplines and 1 double zipline, 2 suspended sky bridges, 1 Spiderman bridge, and a short guided nature trail at the end of your zipline experience (1.5-2 Hours Total). 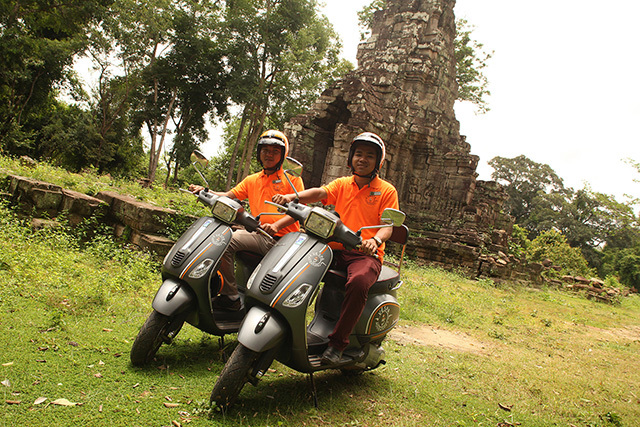 Our Vespa drivers will be waiting for your return and will transfer you to your hotel one final exhilarating ride through the walled city of Angkor Thom. 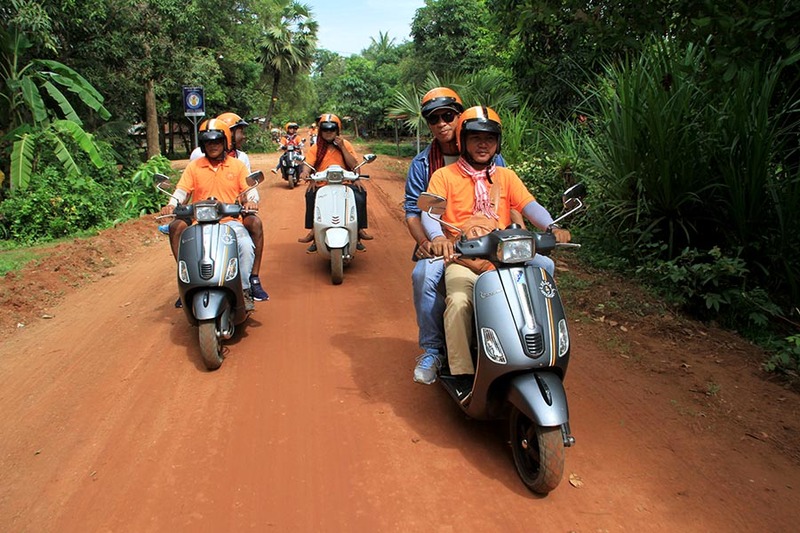 Tags: angkor bike tour, angkor day tour, angkor temples, angkor tours, angkor vespa tour, siem reap activities, siem reap bike tour, siem reap tour.